A amateur cameraman living nearby took this video of the concrete collapsing at Gilstead Road near the Bukit Timah area.were starting to show. And the safety manager of a condominium construction project in Bukit Timah knew something had to give - soon. To prepare for the worst, he called in the authorities at 7.30am yesterday. 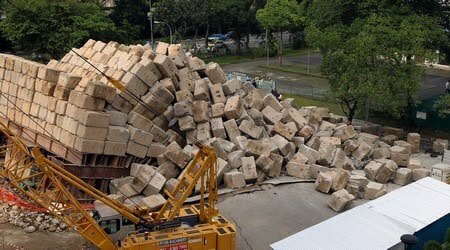 Half an hour later, more than 1,000 concrete blocks - weighing 2,800 tonnes - came crashing down onto Gilstead Road, blocking traffic access. The impact damaged a gas valve in a nearby gas pipe, but no one was hurt. By this time, police and officers from the Singapore Civil Defence Force had already cordoned off an area about the size of two badminton courts on the two-lane road. The incident also caused church-goers of the nearby Life Bible-Presbyterian Church to cancel or relocate their service sessions after police evacuated the premises. Speaking to my paper, a project manager of the affected worksite explained that the concrete blocks had toppled due to "settlement of the earth", which could have been a result of recent heavy rains. The concrete blocks, which were stacked on one side of Gilstead Road, had been visibly leaning forward, he said, declining to be named. He estimated that it would take two to three days to remove all the concrete blocks safely. A Ministry of Manpower (MOM) spokesman said that the concrete blocks had collapsed during a pile load test. The test determines the safe load-carrying capacity of a pile, which is a deep foundation of a building. The condominium being constructed, Gilstead Two, is a 34-storey freehold apartment block slated for completion in 2013. Its developer, Malaysian company Chedstone Investment Holdings, could not be reached for comment yesterday. Singapore Power PowerGrid said that repairs to the damaged gas valve was completed at about 10.30am. There was no interruption in gas supply to residents in the area. MOM said it has instructed the worksite's contractor, Ryobi- Kiso, to work with a professional engineer to remove the concrete blocks - each weighing 2.5 tonnes - from the road safely. The MOM spokesman added: "Meanwhile, all pile load tests on site have been stopped pending further investigations."